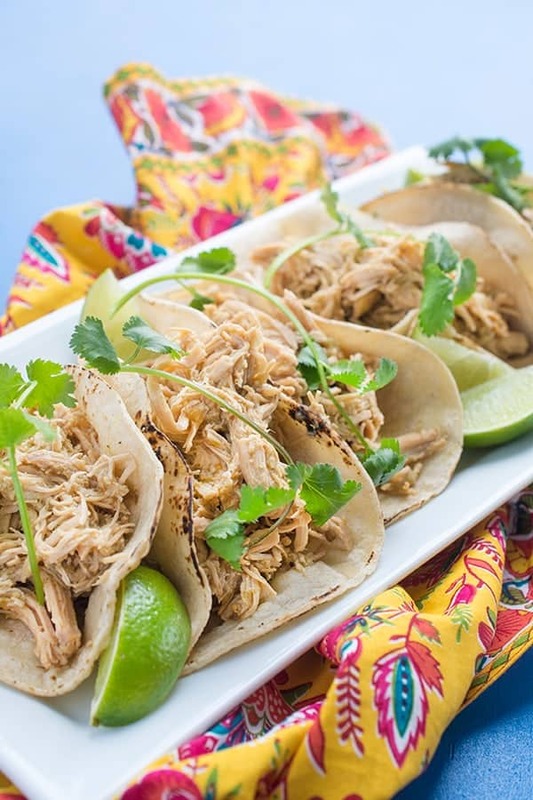 The perfect use for leftover Five Ingredient Salsa Verde, these slow cooker pulled chicken tacos are full of bright, fresh flavors. 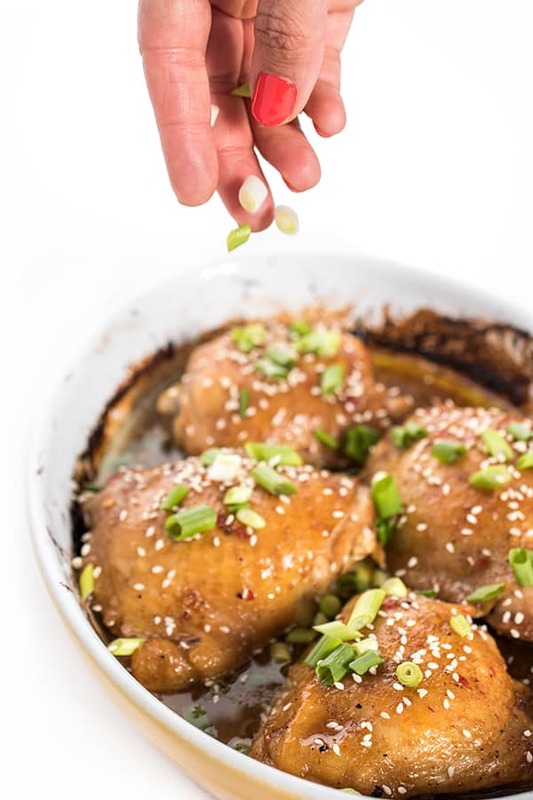 As a busy working mom, I am all about finding ways to re-purpose ingredients throughout the week to save time and money. 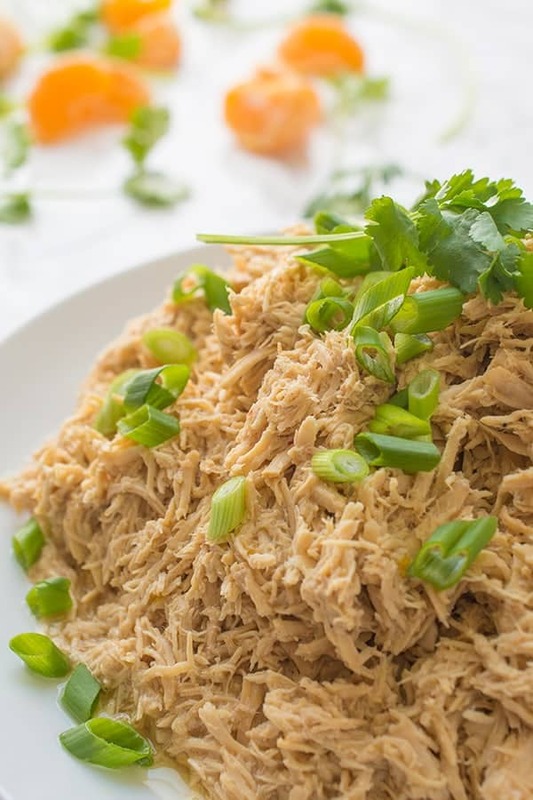 After making a big batch of Five Ingredient Salsa Verde, I knew almost immediately I wanted to use leftovers to create a slow cooker shredded chicken recipe. The end result? Mouth-watering chicken tacos that are full of bright, slights-smoky salsa verde flavors. To make the corn tortillas warm and pliable, I always char them quickly using tongs over the open flame on our stove top. 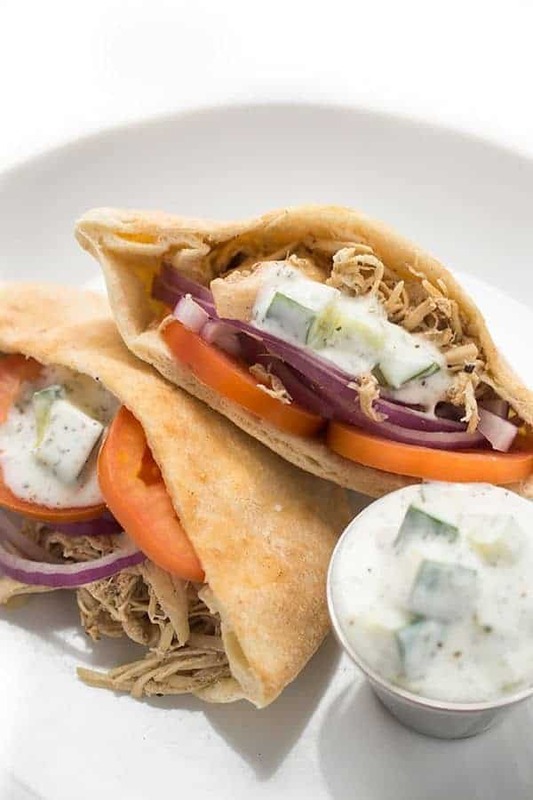 Of course, just like any large-batch pulled meat recipe, you could use leftovers in salads, soups, served over rice or even stuffed into a sweet potato. I love serving it with a fried egg on top as well. The options are endless. 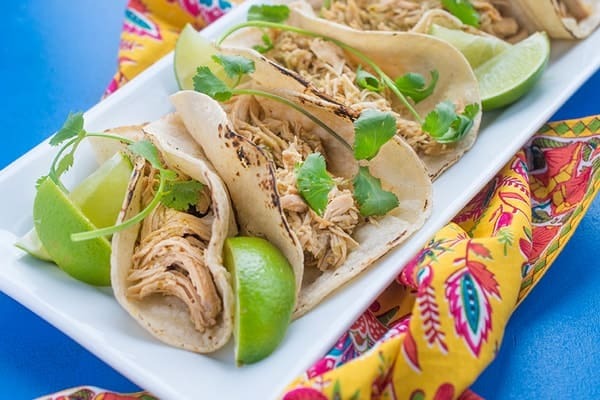 The perfect use for 5-Ingredient Salsa Verde , these pulled chicken tacos are full of bright, fresh flavors. Place the first six ingredients in a slow cooker and heat on low for 6 hours or high for 3 hours. Shred the chicken with two forks and check for seasoning. Add salt or pepper if needed. To warm up the tortillas before serving, carefully run them over an open flame using tongs about 3-4 times per side. Serve with cilantro and lime wedges. Gloria's pickled red onions wouldn't hurt either. 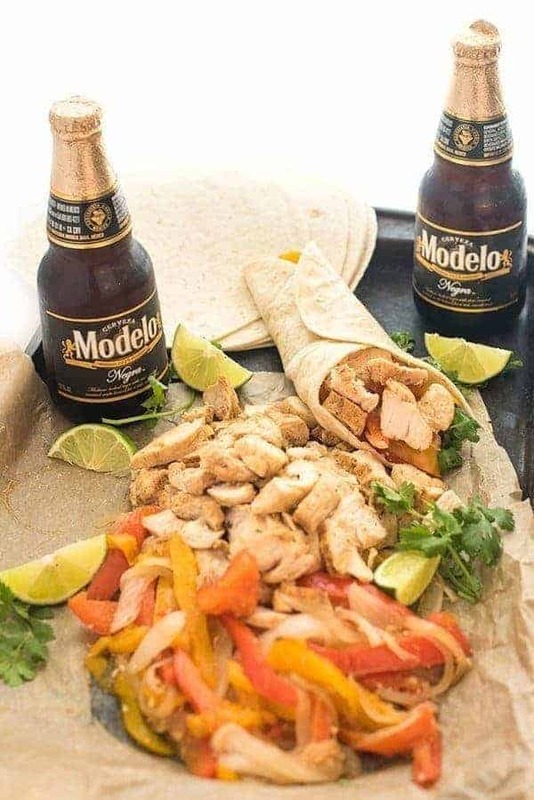 More Healthy Mexican Eats are waiting for you on Pinterest! Works out great! Doesn’t take a rocket scientist to figure out that you don’t put tortillas in the slow cooker. D’oh! Maybe it was a fraternity boy in his first apartment. Amazing dish! Will make again! That’s funny. :) Glad you like it! Trying to make this now! Looks delicious! that´s a funny recipe: ” put all ingredients in a slow cooker…” very funny specially if you add the salsa verde and the tortillas in the cooker…. Directions unclear. 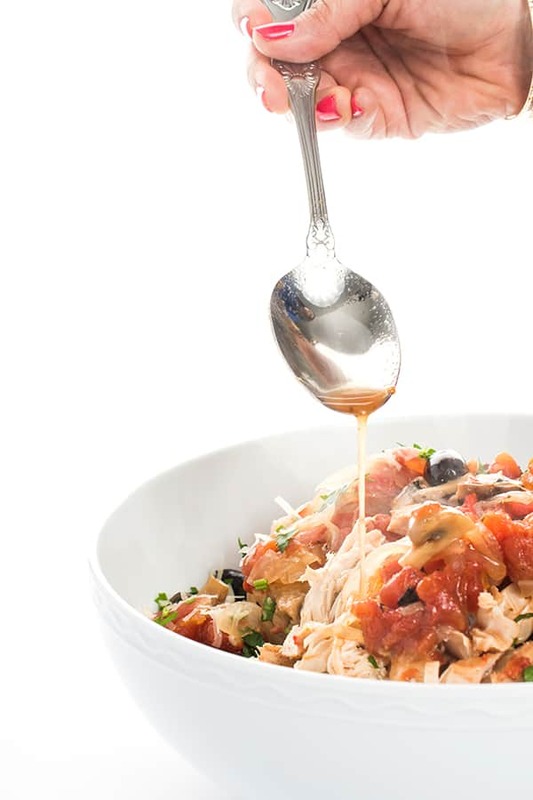 Shred the chicken in the juice or on a plate. If on a plate do yo put the chicken back in the juice? Without the cooking juices, chicken is somewhat dry and tasteless. I love recipes that require few ingredients but are packed full of flavor! This fits that bill for me! LOVE THIS! Thank you so much Michele!!! Enjoy! So craving these right now! You and me both!! Miss you! Great shot! Love how simple and easy this is! Thank you so much – they were so good! Liz, this looks fabulous!! I LOVE Salsa Verde and the fact that you made this in the slow cooker is insane! It was so dang good Kristen!! I hope you try it!